Co-op selection committee participants from the Northern Miami Dade Co-op meet to choose an installer. The Southern Miami Dade co-op has selected Cutler Bay Solar Solutions to install solar panels for the 75-participant (and growing) group. 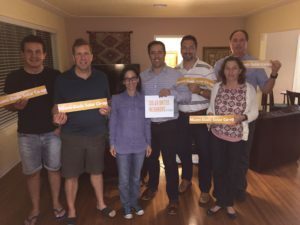 The Northern Miami-Dade co-op has selected Goldin Solar for its 52-participant (and growing) group. Co-op selection committees chose the installers through competitive bidding processes. The groups have held seven public information sessions for residents in the co-op territories to educate the community about solar and the co-op process. The selection committees chose Cutler Bay Solar Solutions because of the variety of quality equipment, price, experience, warranties, and location and selected Goldin Solar for its quality equipment, warranties, experience, pricing, and location. The co-ops are open to new participants until December 15. Residents from Palmetto Bay, Cutler Bay, Homestead, Florida City, Naranja, Goulds, Redland and unincorporated neighborhoods west of US1 and south from SW 136th Street south to the Miami-Dade County Line who are interested in joining the Southern Miami Dade co-op can sign up at the www.solarunitedneighbors.org/southernmiamidade. Residents of Country Club, Miami Lakes, Miami Gardens, Opa-Locka, West Little River, El Portal, Biscayne Park, Miami Shores, North Miami. Unincorporated Miami-Dade from NW 79 Street to the county line can sign up at www.solarunitedneighbors.org/northernmiamidade. Joining the co-op is not a commitment to purchase panels. Both installers will provide each co-ops’ participants with an individualized proposal based on the group rate. By going solar as a group and choosing a single installer, participants can save on the cost of a quality system.